Exploring Cuisines is planning a great midwinter break; we’re going to A Taste of Greece. The date is Sunday, February 24 and the place is Annunciation Greek Church located at 9440 W. Congress St. in Wauwatosa. You will have a chance to sample Greek food like spit roasted chicken and lamb, gyros, pastichio (a sort of Greek lasagna), Greek salad, saganaki (flaming cheese) and homemade Greek pastries. Greek music and dancing are also part of the fun. 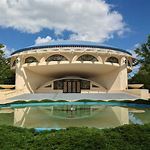 Tours of the famous Frank Lloyd Wright designed church are available in the afternoon. This is a great opportunity to see and hear about this unique church. Admission is free and there is ample parking. Meet to eat at 1:00. Afterwards, take a tour or enjoy the ambience. Call Cindy at (414) 336-8695 if you plan on coming so we can save space at a table.